Verlies uzelf in het eeuwenoude landschap van Uluru en Kata Tjuta tijdens deze driedaagse tour vanuit Alice Springs. U ziet de hoogtepunten van Uluru (Ayers Rock), inclusief de onvergetelijke aanblik van Uluru bij zonsopgang en zonsondergang en u krijgt de kans om langs de rand van de magnifieke Kings Canyon te lopen. This tour was so well coordinated and organized. Our hotel at Uluru was really good but the one at Kings Cross was much more rustic with even ants and lizards in the room. The side tours that we took early in the morning were all very prompt and just as advertised. A great insight into this area and we would highly recommend. This tour is a great value. Everything was very well organize and on time. The guides were knowledgeable and helpful. The bus trip was comfortable and enjoyable. Plenty of stops for breaks and refreshment. The trips out to Uluru were great, but unfortunately we had cloudy weather both for the sunrise and sunset- so no spectacular views of the big rock. The additional walks were not too strenuous, unless you wanted them to be. Just enough of the Outback to get a good feel for what the center of Australia is all about. One suggestion is to be prepared for the flies in some areas. They get a bit chummy. You can purchase a fly net to wear over your hat just about anywhere in the Outback and that is probably a good idea depending on when you go. Also, the weather report we checked before we went said extremely hot weather, but it actually rained for a couple of the days- which if it hadn't been raining when we left Sydney wearing rain gear, could have been a little uncomfortable. We did the superior accommodations with the BBQ. Hotels were very nice, clean and comfy. The BBQ was okay, but could probably be skipped if you are doing the sunrise trip to Uluru. If you do the BBQ you end up with a very short 3-4 hour overnight for sleep as you don't get back to the hotel until after 10 and are up before dawn for the time we went in December. Overall, very good value, extremely well organized, clean and comfy accommodations and nice and knowledgeable guides and drivers. Highly recommended! The tour was excellent. Here is some information your future travelers. First do not worry about getting coffee or breakfast before crazy early bus pickups as the tour will soon go to a road travel stop or will provide you with free coffee and snack bars. Second do bring many large bottles of water as all the hotels sell bottled water at 3x the cost in a convenience store. Third realize that some of the timing of bus arrivals and departures are at odds with the hotel schedules: e.g. normal checking and checkout times. Ignore the checkout issue as the hotels will not care even if you are more than an hour late in checkout. The checkin can be an issue ... and is an issue the tour bus company should improve. Finally note that this is a very very busy tour. My recommendation to the bus tour company would be to offer a gentle afternoon option at Uiuru, to leave the hotels at not 2:30pm but rather 4pm with a short visit to the Uluru visitor center and the rock itself in time for the great sunset viewing party. Else have fun! I thought that the inclusion of Kings Canyon was not worthwhile. The distances are great and required a lot of bus riding. An extra night in Uluru Eyres Rock would have been wonderful. Not enough time there. Sails in the Desert resort was first rate. I would suggest taking trips out of Uluru and omitting Kings Canyon. The bus company is very well organized and drivers excellent but just too much time spent on bus. Amazing - lots of walking but some stunning views and very knowledgable people. I will remember this experience for life and highly recommend anyone to do this. Some say 'why go to see a rock in the middle?' but we're so pleased we did. Although it was an intense 3 days tour, we certainly enjoyed all the activities included. The AATKings operators were good, excellent drivers and tour guides, very knowledgable and fun. Not being from Australia, we learned a lot about the culture, history and beauty of every place we visited and the aboriginal people, in a very short 5 days visit from Alice Springs to Uluru, Kings Canyon and the Olgas. Highly recommended . Fantastic trip, great guides and drivers with heaps of local knowledge. This trip was absolutely fantastic - I really only booked for Uluru but Kata Tjuta and the Kings Canyon trip also included were just spectacular! As a single person I felt completely safe all the time and the drivers and guides were so friendly and informative - Thankyou especially to Tanya my driver for making this trip such a laugh. 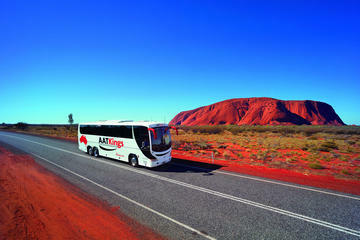 Great value for money and I totally recommend this to anyone wanting the full Uluru experience. Very well organised! All coach drivers very pleasant and knowledgeable. An excellent introduction to Central Australia! Great sights. An interesting landscape. Great driver - Karl - was friendly, helpful. Commentary was informative and respectful of local culture of indigenous population. Accommodation was good.